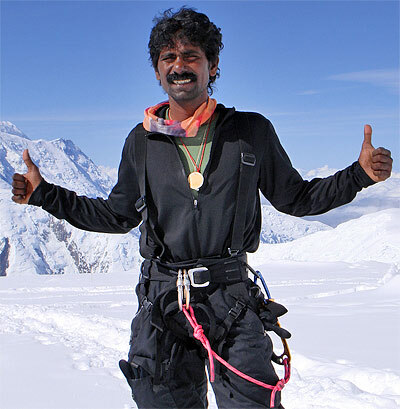 While placements at IIM-C would be the most lucrative opportunity for majority, Malli Mastan Babu made an apparently appalling decision – He chose not to accept any of them and prepared himself to climb the highest mountains and peaks of the world. “Challenge is what fascinates me, ‘never give up’ enthralls me and I am free spirit to accomplish what I wish for” that’s what he believes for himself. So how did he get into it? While growing up in the wilderness of palm trees, Jamun trees and hills in a small village Gandhi Janasangam on the bank of River Pinakini in Andhra Pradesh, he would often venture into nature’s wilderness for exploring more and nurture the dream of Himalayan Adventures through the ‘Drama in Real Life’ of Reader’s Digest. Later, despite having an academically and professionally strong background, he chose to live for his passion which was furthered initiated by a senior fellow of his school Uday Bhaskar Rao who lost his life on Mt. Everest during an Indian Army expedition in 1984. Upon completion of studies, he came to know about distinctive achievements of Reinhold Messner, Junko Tabei, Jerzy Kukuczka, Till Man, Francis Smyth, Eric Shipton, Norman Hardie and Chris Bonington that furthered his resolve. One by one, he kept conquering most difficult summits including Mt. Vinson Massif, the tallest peak of Antarctica, Mt. Carstensz Pyramid, the tallest peak of Oceania and many more. His name is registered in Guinness World Record for being the fastest Summiteer who conquered world’s 7 summits within 172 days from Jan 19 to July 10, 2006. He has been invited at companies like GE, Intel, John Deere to give lectures on leadership and management, and different cultural and social organizations as well as management schools in India, US, Kenya, and Dubai. In 2009, he was also invited at the Second International Conference to speak on “Igniting the Genius within” organized by the Indian School of Business in Hyderabad.